The March corn contract posted an new contract low on a day the USDA released what was seen as a mildly friendly report. 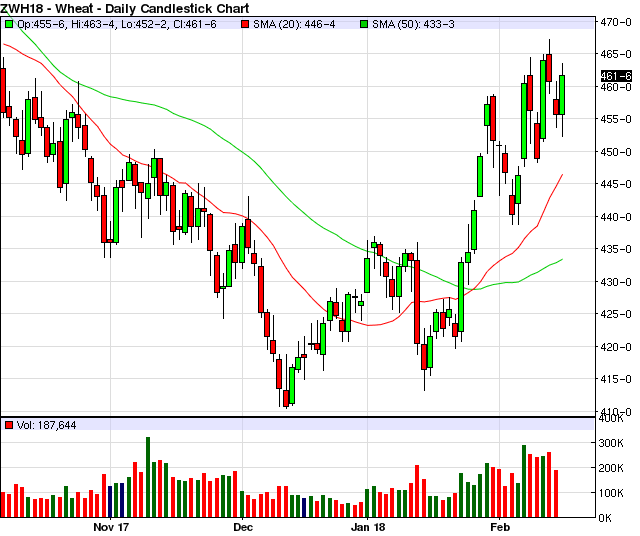 The initial reaction to the report was positive, but weakness in soybeans and wheat spilled over to the con market. What happened and what could this mean for corn going forward? On Tuesday the USDA released the December World Agricultural Supply and Demand Estimates (WASDE) report. For corn it was a slightly bullish report with ending stocks coming in below trade estimates. The lower ending stocks number came from a 50 million bushel increase in corn used for ethanol while the USDA left export demand unchanged. The higher estimate for corn used for ethanol seemed likely as ethanol production has been significantly higher then what was needed on a weekly basis to hit the target the USDA estimated in the November report. The reasoning the USDA used was that China's recent large purchases of sorghum would take away some of the domestic ethanol feedstock supplies and that corn would be needed to fill the void. The USDA left exports unchanged however, and many analysts believe that current projections are too high as corn exports are running well behind levels needed to hit the USDA target. The initial reaction to the report was positive for corn, at one point trading 4 cents higher on the day. 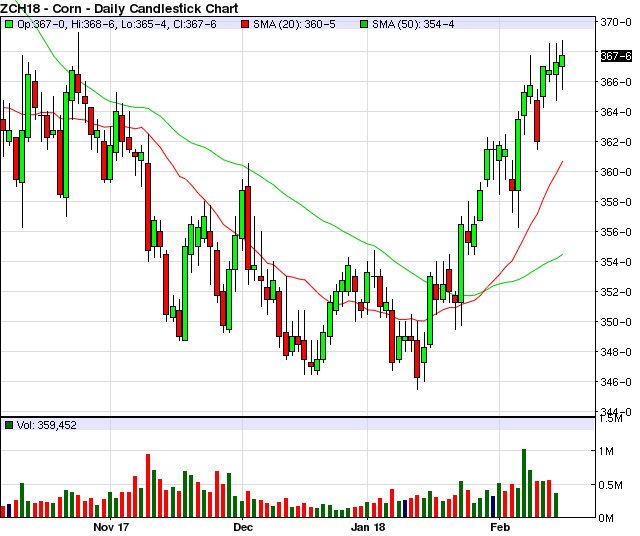 Shortly after the report corn tested it's 20-day moving average which has been significant resistance lately. 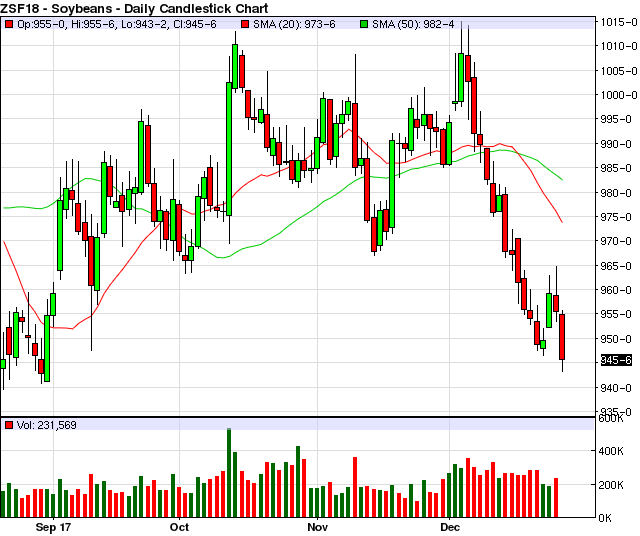 However, by the end of the day corn had reversed lower in an outside sweeping down day to close at new contract lows. This meltdown also shattered a potential inverse head and shoulders bottoming formation. While the report was mildly friendly for corn is was slightly bearish for soybeans and wheat. Even so, soybeans and wheat tried to play along with corn initially with both going higher on the day. But, mid-day weather changed the tone dramatically. The mid-day weather forecast came out about an hour after the report and added more confidence for much needed rains in Argentina for the late10-14 day outlook. This weighed heavily on soybeans and ultimately too corn and wheat down as well. Technically speaking, this was a difficult day for the grain complex with chart damage happening across the board. What posted yet another new contract low (but is getting very oversold in the near term). Soybeans broke key trend line support as did soybean meal. And, corn not only made new contract lows but had an outside sweeping reversal down day that may have shattered the hope of an near term bottoming formation. Today did not bode well for any immediate strength in the grains. Unless the Argentinean forecast dries up dramatically there could be more downside follow through to come. It is a difficult time of year to be very bearish in the grains markets and South American (particularly Argentinean) weather will be key, but unless there are some real weather issues it could be a long winter for grain bulls.